Alkaline water helps you lose weight, regulate blood pressure, rid the body of toxins, clear out acids, lower cholesterol, and much more. The VA-31 Agua Alcalina® ioniser is manufactured in Spain. 2-year warranty. Alkaline water helps you lose weight, regulate blood pressure, rid the body of toxins, clear out acids, lower cholesterol, and much more. The VA-31 Agua Alcalina® ionizer is manufactured in Spain. 2-year warranty. 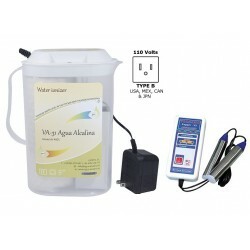 Offer Pack 2 VA-31 Agua Alcalina® ionisers with a gift pH meter. This device removes all viruses and parasites from our bodies in just a few minutes. Alkaline pitcher with bio-ceramic filter, pH between 8.0 and 9.0, ORP - 100 mV. Exquisite, elegant, portable Removes odours, kills bacteria and microbes.Scatters smoke and masses dust.Prevents infection spreadingDisintegrates pesticides, chemical fertilizers and hormones.Oxidizes heavy metal and organic substances.Removes various odours. 110 V, American plug Alkaline water helps you lose weight, regulate blood pressure, rid the body of toxins, clear out acids, lower cholesterol, and much more. The VA-31 Agua Alcalina® ioniser is manufactured in Spain. 2-year warranty. 110V, American plug Alkaline water helps you lose weight, regulate blood pressure, rid the body of toxins, clear out acids, lower cholesterol, and much more. The VA-31 Agua Alcalina® ionizer is manufactured in Spain. 2-year warranty. VA-31 Agua Alcalina accessories. Handmade eco-friendly kaolin pot. Two sachets of pH buffer power for 250 ml of buffer solution each. The buffer solution is used for calibrating the digital pH meter and is enough for 50-60 calibrations. JUPETO SL is a company that started out in 2003 in order to popularise alkaline water in Spain, a product that has been on sale in Eastern Europe and Japan for over 50 years now and with great consumer acceptance. This led to the creation of the VA-31 Agua Alcalina®, our ioniser that has been used by thousands of people inside and outside Spain. The health benefits offered by alkaline water are clear. Health is the greatest freedom of human beings and we deserve to have different options, which is why we are here. Our goal: to make good things affordable for everyone. We are now ready to move forward with this ever-so-important project for us and for all the people who so far have benefited from it, and we do so with our spirit revitalised by the signs of affection that we receive daily and in our ongoing quest for new solutions that make people's lives healthier. We want to share what we have with you.